I really enjoy the blog Kitchen Fun with my 3 Sons. She has such a fun way of presenting food, that any kid would want to eat their veggies. 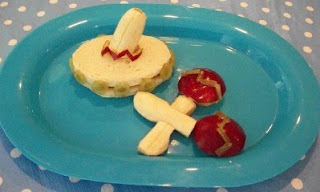 In honor of Cinco de Mayo she designed this Mexican themed lunch out of peaut butter, jelly and fruit. Not only it is adorable to look at but good for you too. To see how she made this and many of her other great meals make sure to check out Kitchen Fun with my 3 sons here.